4 years ago right now I was “stuck” in a job that I was miserable in. I knew I was meant for much bigger things than the corporate job that was stifling what I had to give to the world. I was afraid and was numbing myself and my soul’s calling with alcohol. I longed to make a difference in the world and so desperately wanted to help others. I knew that was what I was meant to do but had no idea what that would look like. Fast forward 2 months. 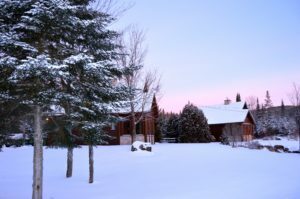 The setting was the chalet in the Laurentian mountains of Quebec where my husband and I spend the Christmas or New Year’s holidays every year. I had been contemplating enrolling in a coaching program for a few weeks but was scared to commit. I myself had experienced some amazing, transformative shifts having worked with a Life Coach but didn’t know if I could do it myself and frankly was terrified to put myself out there. But right there in that idyllic setting I decided that despite the fear I was feeling, I was going to do it anyway. Regardless of all the fear, I was going to step into what I believed to be calling me and do it anyway. The fear didn’t magically go away, but I enrolled anyway. Trusting in the guidance I was feeling. Up until recently the official answer was “no” but I had been coaching people. Veterinarians, veterinary technicians, shelter workers and directors and animal research professionals. Despite the 20+ years I’ve worked in the veterinary field, I’ve learned a lot from coaching these folks and many have made some pretty miraculous transformations in their lives. But I hadn’t yet made it a public offering. Now I’m opening up one-on-one coaching and if that speaks to you, if that resonates with you in some way then I hope you will connect with me because I want to help you. I want to help you get out of your own way. I’ve been there. I want to help you feel good, not overwhelmed, angry, resentful and drained. I’ve been there. I want to help you see that you are not trapped in your work. You have choices. I’ve been there. I want to help you take responsibility for how you feel and be able to feel anyway you want. I’ve been there too. Lastly, I want to free you from your beliefs and negative self-talk that tell you you aren’t ______ enough (smart, good, thin, etc.). Oh I’ve been there my friend. You are capable of having the exact life you want. I know that with absolute certainty. Let me help you.